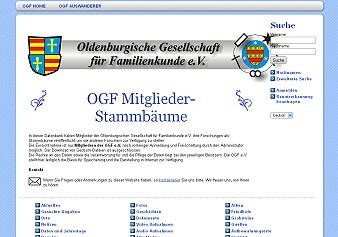 Oldenburg Society for Family Research – Oldenburgische Gesellschaft für Familienkunde e.V. The Oldenburg Society for Family Research has been founded in 1927 as a sub-group of the Oldenburg Historical Society (Landesverein für Geschichte, Natur- und Heimatkunde e.V.). The scope of activity of the society is genealogical research , with particular emphasis on the area of the former grand duchy of Oldenburg. Around 1800 in this area were 78 lutheran parishes and 29 catholic parishes, the latter ones concentrated in the southern part of the dukedom, within the counties of Cloppenburg and Vechta. See list of parishes for details on each of the church communities. During the months from October to April of every year there are 6 lectures or presentations on genealogical or local historical subjects. To the attendees these lectures provide insights and ideas for their own genealogical research. For details see: OGF-Lectures. 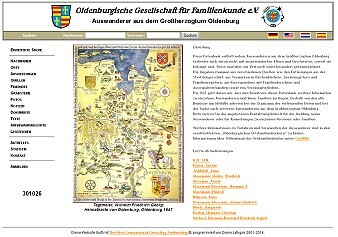 For our members we publish a genealogical journal ‘Oldenburgische Familienkunde’ . In this journal we cover a broad scope of research summaries, details on new genealogical sources and other subjects of common interest to society members. The ‘Oldenburgische Familienkunde’ is published in 4 books per year. Sometimes 2 books are combined into a double-issue. We have regularly published for over 40 years. Most of the books are still available. See list of available publications: OGF-publications. Available publications can be ordered at our Online-Shop. Our library as well as many research results of our members are located at the Staatsarchiv Oldenburg, Damm 43. They can be consulted there during office hours (ask for: Bestand OGF). In order to prepare for a productive use of the archive, we have prepared a book titled ‚Bücherverzeichnis OGF’. It contains 5000 titles, with ancestry charts, descendency charts and other genealogical material included. This Catalog shows the inventory. Currently, our library is going to be integrated into the online catalog ↑ of the Staatsarchiv Oldenburg. The original church records of our area are very old. Many of them are in a critical condition and all of them are difficult to read. A team of volunteers is working on converting the original church records into computer files. Mr. Dierk Feye, Fichtenstr. 8, 26315 Varel, is coordinating the activity of the different team members. A lot still needs to be done. Whoever wants to contribute to this work is asked to contact Dierk Feye (E-mail: Dierk Feye). If you know the name of the parish, look first at our list of parishes. For many of our parishes you will find there experts, who can help you. those institutions which are named as location for church records. We recommend to adress yourself to the central offices (State Archive, Offizialat, lutheran church council) rather than to the individual parish offices. Give your full postal home adress, if you decide to write per e-mail to the State Archive (poststelle@staatsarchiv-ol.niedersachsen.de), Bischöfliches Offizialat in Vechta (archiv@bmo-vechta.de) or to the lutheran church council (archiv-okr@ev-kirche-oldenburg.de). for general questions, and if you do not know the name of the parish, ask the Oldenburg Genealogical Society, E-mail: Gerold Diers. We ask you to be patient in expecting answers. In many cases this research implies significant work as well as travel expenses and fees to pay at the public archives. In those cases we will advise you of the approx. payments due, before we start working on your request. The membership fee is 25,- € annually for members living in Germany. Because of the substantially higher postal fees we have to ask 30,- € annually from members living outside Germany. Our bank account is with LzO, Account No. 000407577 (Bank Code 28050100). The church records are located as follows. the original records are kept at the office of the local parishes. (only in a few exceptions, these originals have been given to the state archive). Records begin in some parishes as early as 1573 (Blexen) or 1578 (Eckwarden). In most cases records start during the 17th century. Mikrofiches of all church records, up to approx. 1810, are stored in the archive of the church council. ( ev.-luth. Oberkirchenrat, Philosophenweg 1, 26121 Oldenburg, Tel. 0441-7701-0). They can be consulted there during office hours. Please reserve time in advance. Copies of all church records after 1800 (for the Jever area after 1825) are stored at the state archive. (Staatsarchiv Oldenburg, Damm 43, 26135 Oldenburg, Tel. 0441-9244-100 ). They can be consulted there during office hours. For the parishes of the catholic church. Copies of all church records of the Oldenburger Münsterland (the southern part of Oldenburg, the counties Cloppenburg and Vechta), are kept at the archive of the Bischöflich Münstersches Offizialat, Bahnhofstr.6, 49377 Vechta, Tel. 04441-872-0. They can be consulted there during office hours. Records for these parishes start in general during the 17th century. Civil records about birth, marriage and death of all persons regardless of religion are maintained at the public community offices since 1876. Questions have to be directed to the community office, where the looked for person had its residence. A lot old documents can be found in the Oldenburg State Archive. You’ll find there medieval documents, tax registers, fire insurance records and many other items which have been recorded in ancient times within the area of the dukedom Oldenburg. This mailing list is open only for members of the Oldenburg genealogical Society. To participate in this list, please select page http://list.genealogy.net/mailman/listinfo/OGF-L ↑. If you are a member of the OGF, the list administrator will enable your access. To participate in this bilingual mailinglist (englisch/german) at genealogy.net, just drop a mail to: oldenburg-L-request@genealogy.net with the text: subscribe in the message body. To use this open german speaking mailinglist at genealogy.net (which is dealing with the entire north german territory) please send an e-mail to famnord-request@genealogy.net with the text subscribe in the message body.